Savatin, D. V., Bisceglia, N. G., Gravino, M., Fabbri, C., Pontiggia, D. and Mattei, B. (2015). Camalexin Quantification in Arabidopsis thaliana Leaves Infected with Botrytis cinerea. Bio-protocol 5(2): e1379. DOI: 10.21769/BioProtoc.1379. Savatin, D. V., Bisceglia, N. G., Marti, L., Fabbri, C., Cervone, F. and De Lorenzo, G. (2014). The Arabidopsis NUCLEUS- AND PHRAGMOPLAST-LOCALIZED KINASE1-Related Protein Kinases Are Required for Elicitor-Induced Oxidative Burst and Immunity. Plant Physiol 165(3): 1188-1202. Phytoalexins are heterogeneous low molecular mass secondary metabolites with antimicrobial activity produced at the infection site in response to pathogen invasion and represent an important part of the plant defense repertoire. 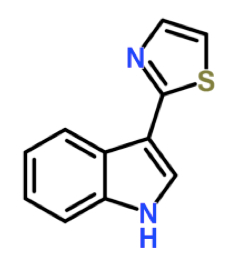 Camalexin (3-Thiazol-2′-yl-indole) is a known phytoalexin first detected and isolated in Camelina sativa, from which it takes its name, infected with Alternaria brassicae (Browne et al., 1991). Production of camalexin is also induced in Arabidopsis thaliana leaves by a range of biotrophic and necrotrophic plant pathogens (bacteria, oomycetes, fungi and viruses) (Ahuja et al., 2012) as well as by abiotic stresses, such as UV and chemicals (e.g. acifluorfen, paraquat, chlorsulfuron and α-amino butyric acid) (Zhao et al., 1998; Tierens et al., 2002). Camalexin originates from tryptophan and CYP79B2 and CYP71B15 (PAD3) are P450 enzymes that catalyze important steps in its biosynthetic pathway (Glawischnig, 2007). The detection and quantification of camalexin content is required to understand how it is produced upon various stress conditions. Here we describe an easy method for camalexin extraction from Arabidopsis leaves infected with the necrotrophic fungus Botrytis cinerea, and further determination of camalexin levels by liquid chromatography–mass spectrometry (LC-MS). The method is sensitive enough to trace amount of camalexin down to the low pico-gram (10 pg/mg FW) range. At least 50-100 mg of 4-week-old Arabidopsis plant leaves are required. Arabidopsis leaves should be weighed before freezing in liquid nitrogen. At least 4 biological replicates for each sample should be analyzed. Prepare and pre-cool the extraction buffer. Pre-cool centrifuge rotor at 4 °C. Freeze weighed Arabidopsis leaves in liquid nitrogen. Grind the leaf tissue into powder by using mortar and pestle. Transfer each sample into a round bottom screw-capped borosilicate glass tube (Pyrex) by using the spatula. Keep the sample in ice. Add extraction buffer in each tube, keeping the ratio 1:10 [tissue (mg): extraction buffer (µl)]. Vortex the samples for 20 sec. Shake tubes on the rocking shaker (30 min, 100 rpm, 4 °C). Add DCM in each sample keeping the ratio 1:2 [extraction buffer (µl): DCM (µl)]. Centrifuge (10 min, 5,000 x g, 4 °C). Note: After centrifugation two phases will form. Camalexin is contained in the lower green phase while the upper phase contains mostly DCM. Plant debris will be present between the two layers. Collect the lower phase by using a glass Pasteur pipette and transfer it into disposable borosilicate glass culture tubes (Pyrex). Note: Special attention should be paid not to recover any material floating in the interface between the two phases. 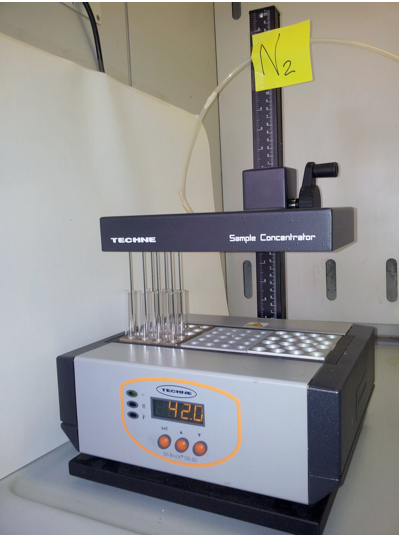 Concentrate the collected lower phase under nitrogen gas flow (10 bar) and heating the tubes at 42 °C. Allow sample to completely dry and then suspend it in methanol with a ratio 1:1 [tissue (mg): methanol (µl)]. Filter samples by using spin-X centrifuge tube (5 min, 10,000 x g, 4 °C). Transfer the filtered samples into glass-capped vials. In these conditions camalexin will elute with a retention time of 15 min (see Figure 3). 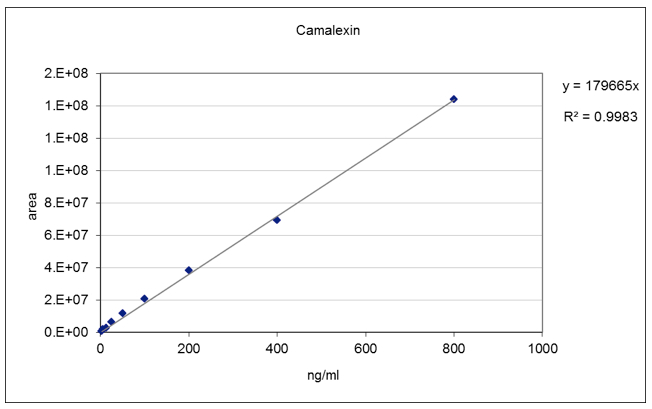 Determine the abundance of camalexin by using the calibration curve method. Use a concentration of camalexin 800-400-200-100-50-25-12.5-6.25-3.12 ng/ml for the preparation of standard curve solutions (see Figure 4). Figure 2. Sample concentration. Evaporation is increased by passing an inert gas (N2) over the surface of the sample to remove the solvent. The gas travels through the gas chamber to the samples via the needles. Figure 3. LC-MS analyisis of camalexin from external standard (upper panels) and from the plant tissue (lower panels). A. Total ion chromatograms (TICs). B. ESI mass spectra in positive ionization mode. The mass of 201.048 corresponds to C11H9N2S, the protonated form of camalexin [M+H]+ (red arrows). Figure 4. Camalexin standard curve. A linear standard curve was obtained in the concentration range between 3.12 - 800 ng/ml. This work was supported by the European Research Council (advanced grant no. 233083). Part of the procedures were adapted from a previously described protocol for quantitative analysis of major plant hormones from crude plant extracts (Pan et al., 2010). Ahuja, I., Kissen, R. and Bones, A. M. (2012). Phytoalexins in defense against pathogens. Trends Plant Sci 17(2): 73-90. Browne, L. M., Conn, K. L., Ayert, W. A. and Tewari, J. P. (1991). The camalexins: New phytoalexins produced in the leaves of camelina sativa (cruciferae). Tetrahedron 47(24): 3909-3914. Glawischnig, E. (2007). Camalexin. Phytochemistry 68(4): 401-406. Pan, X., Welti, R. and Wang, X. (2010). Quantitative analysis of major plant hormones in crude plant extracts by high-performance liquid chromatography-mass spectrometry. Nat Protoc 5(6): 986-992. Tierens, K. F. J., Thomma, B. P., Bari, R. P., Garmier, M., Eggermont, K., Brouwer, M., Penninckx, I. A., Broekaert, W. F. and Cammue, B. (2002). Esa1, an Arabidopsis mutant with enhanced susceptibility to a range of necrotrophic fungal pathogens, shows a distorted induction of defense responses by reactive oxygen generating compounds. Plant J 29(2): 131-140. Zhao, J., Williams, C. C. and Last, R. L. (1998). Induction of Arabidopsis tryptophan pathway enzymes and camalexin by amino acid starvation, oxidative stress, and an abiotic elicitor. Plant Cell 10(3): 359-370.